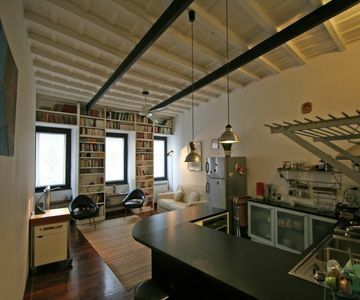 The apartment, about 60 sqm, is located on the first floor of a nice and characteristic building. - A spacious living room with fully equipped kitchenette and a comfortable double sofa bed. This vacation apartment is provided with air-conditioning, washing machine with dryer, dish-washer, microwave, TV, Wi-Fi Internet, independent heating, iron and ironing board, DVD player. It comes complete with linens and towels. To get to the apartment from Termini station, take the Underground Line A to Barberini, then the Bus Line 116 towards Terminal Gianicolo, for 12 stops (Giulia Polverone). Walk for 5 minutes crossing Sisto Bridge.